Moving into Karnataka is a wonderful experience. The wide range of tourist spots and the excellent climate is an added beauty to this state. It is fast developing in the IT sector and hence, a lot of employment opportunities are being created at a fast pace. This has resulted in more people moving into Karnataka, especially, cities like Bangalore, Mysore, Belgaum and Mangalore to seek employment. Consequently, the need for rental homes has considerably increased. But though the city has a place for all, you necessarily need to know the procedure of renting followed in this city. Alternatively, you can use our customizable, lawyer verified ready to use rental agreements to save time and money. Registration charges for rental agreements in Karnataka stand at 1% of rent+deposit. Although many people overlook the importance of paying proper stamp duty and registering the document, these factors cannot be simply ignored. If appropriate stamp Duty is not paid, should a dispute arise, parties involved may have to pay ten times the original value as a penalty. Likewise, not registering a document too, has harsh consequences. An unregistered document will never be accepted as primary evidence, such documents are only considered as collateral in courts. Karnataka was one of the first states to implement e-Stamping and to this date remains as one of the states where e-Stamp papers have almost completely replaced traditional stamp papers. They are easily available, typically from co-operative banks and are issued in a wide range of values. For leases with a term of 11 months or less, notarization is not necessary. For leases created for a year or more, registration (not notarization) is recommended. This is a fraud-deterrent precaution which proves that the entities mentioned in the contract are the ones who actually signed it and that the agreement is not a forged or fake one. Lock-in period – This refers to the minimum period before which neither the owner nor the tenant can terminate the rental agreement. Pets – Discusses permission to accommodate pets inside the premises given up for rent. Overstay – If the tenant continues to occupy the property even after the agreement term has expired, the Landlord can charge a penalty on per day basis. Penalty for late payment – If the tenant fails to pay the rent on or before the scheduled date, a small penalty or fine can be imposed by the owner. Painting, maintenance and repairs – These are clauses that are to be included in the agreement to provide clarity about the duties of the landlord and that of the tenant. Food habits – The owner should be open about disclosing whether the tenant can cook non-vegetarian food in the premises. In Karnataka, the term of renting is usually 11 months which can be renewed at the end of 11th month.The tenant has to pay a monthly rent. Additionally, the electricity and water charges are to be paid as per the usage. Check with the owner what is the rate per unit that is charged in the meter. Another popular method of renting is the long term lease. In this, a lump sum amount is paid as a one-time deposit for a certain period or term of lease like 2 years or 3 years. The tenant or lessee does not pay any monthly rent. At the end of the lease period, the owner has to refund the entire deposit money without any interest. In a long-term lease, the benefit is that there is no hassle of paying monthly rent and a lot can be saved in this type of lease. There may be maintenance, electricity and water charges that need to be paid regularly. The renting should be for either residential or commercial purpose. There should be a written agreement between the owner and tenant. The agreement should be printed on a Stamp paper of minimum value of Rs.100 or 200/-. Stamp duty is 1% of the total rent plus deposit paid annually or Rs. 500/- whichever is lower. So if you need to be on a safer side you can make the agreement on a Stamp paper of the appropriate value as prescribed by the government. The house or flat should be neatly painted and handed over to the tenant at the time of renting. At the time of vacating many owners make a deduction of painting charges from the deposit which depends on the agreement terms. Some owners request for only vegetarians and this should be disclosed before entering into the agreement. A rental agreement should be registered at a Sub-Registrar office if the term of the agreement is more than 11 months. If the term is less than 11 months, it is safer to still register it but is not mandatory. 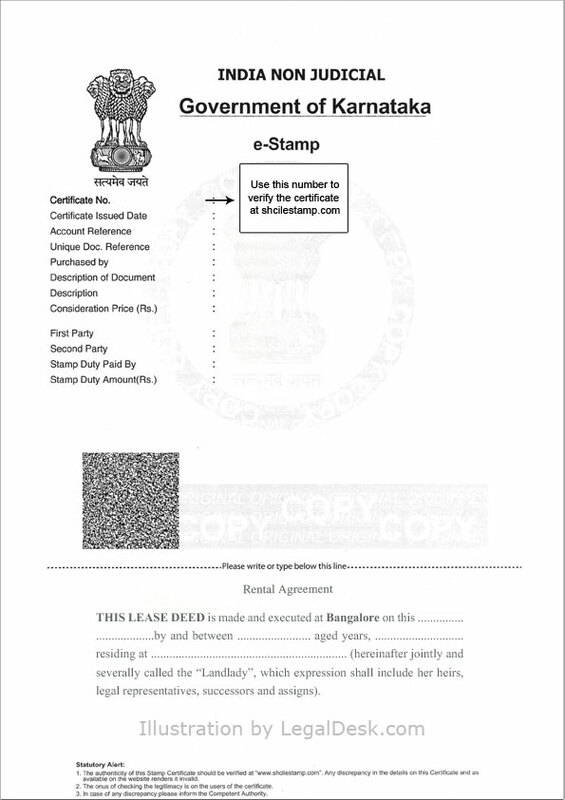 A registered and duly Stamped rental agreement is always a valid evidence in Courts if any legal disputes arise. Registration charges are 1% of the total annual rent and deposit that also should be paid at the time of registration. Finding a place to rent for a comfortable stay is really a tiresome and time and energy consuming task. In Karnataka, the rent and lease are controlled by The Karnataka Rent Control Act, 2001. The person taking the house for rent is termed the Tenant/Lessee and the person letting out the premise is the Owner/Landlord/Lessor. whether there is an agent or broker to whom you need to pay a brokerage of one-month rent. verify the Identity of the Owner by asking for his/her ID proof and also whether the rental property belongs to the same person you are dealing with. For this, you can check the Electricity Bill or Tax Bill. In case you pay any token advance request for a receipt or try to make it by cheque, DD or online transfer. Talk all terms initially itself. Deposit – Usually in Karnataka, 10 months worth of rent is collected upfront as the security deposit. In Bangalore, this is almost always followed. But in other popular cities like Mysore, Belgaum, Mangalore, Hubli-Dharwad and Davanagere it varies from 6 months to 8 months. Some of them may even charge only 2-3 months of rent as security deposit. You can negotiate on the deposit amount if it is too high. If the owner does not reduce the rent then request him to reduce the deposit amount. Token Advance – Usually there is a system in Karnataka to pay a token advance before paying the full deposit amount. This is done in order to block the house by the tenant so that the owner does not give the house to any other person. But there is a lot of discrepancies in this. Many people fail to take a receipt while paying token advance. You should always create a proof of any payments done in a rental transaction either by way of cheque or DD or online transfer etc. If payment is made by cash, then request the owner to send you an SMS or get it in writing as a receipt of the payment. But once a token advance is paid, the owner stops (or is expected to stop) showing the house to other tenants. Sometimes you may decide not to proceed with the agreement and may want back the token advance paid. In such case, if the owner agrees to refund the full advance it is well and good. But if the owner undergoes any loss of money then he may deduct some amount from the token advance and return the same to you. but if your reason for withdrawing from the agreement is legally valid then you can claim the full amount back. LegalDesk.com offers a very convenient way to draft your rental agreement online and without the hassles of having to visit lawyers or look for stamp papers. 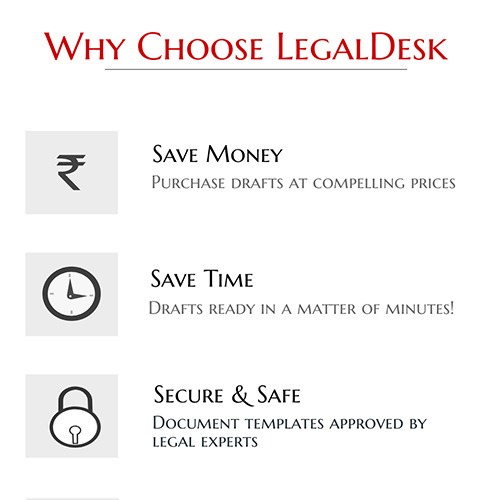 You can also create a host of other legal documents with LegalDesk.com! Choose your State from the drop-down given below and click ‘Create Document’ button. Fill in details of Landlord, Tenant & property to be rented out. Add additional clauses if you wish to and customize the document as per your needs. Review the document and print the soft copy yourself or allow us to print your deed on Stamp paper and mail it to you. Sign the agreement and Register it at a local Sub-Registrar office.